The Product Catalog provides a quick-access window for selecting items for configuration. It contains information about all item master data records as it relates to the web catalog. 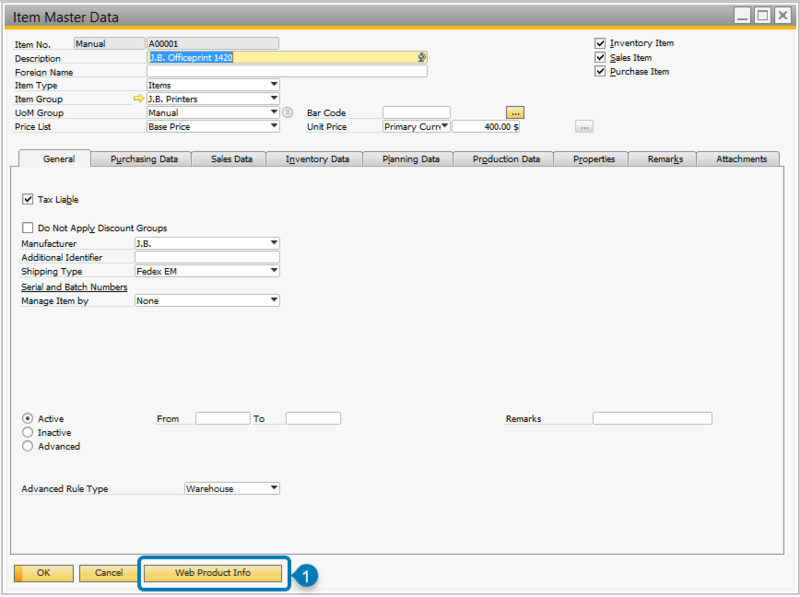 Filters may be applied to select a subset of item master data records. Details that are listed on this screen include Item Master Data codes, whether that item master has been configured for the web, and what web tags have been applied to the web item, etc. Select a language (1). Apply filter options (2). Restrict the filter (3 and 4). Add/Remove a web item from selected master data (5). Close (6). Different Languages may be configured differently. Select the Language to view web products configured for that language. Filter criteria and value must be specified to display a list of items. Once values are selected, the filter can be applied by pressing the Refresh button. Further refine what is displayed within the items list. If checked, the only item master data that will be displayed is that which has not yet been configured for the web. That is, if it doesn’t have a web product item, it will be displayed. If un-checked, all items will be displayed. Use + to add a web item to the selected item master data record. Use - to remove an existing web item from the selected item master data record. Go to: InterConnect Manager AddOn > Customer Portal B2B > Manage Products. Apply a filter to view a list of items. To do this, select a “Filter By” option (marker 2 above) and hit the “Refresh” button to apply the filter. Use the golden-arrow link in the Item Code column to open the item master data, or use the golden-arrow link in the Web Product Name column to edit existing Web Product Details. If there is no Web Product Details for an item master, a new Web Product may be created by accessing the Web Product Info button on the item master data screen. Use the Manage Web Info button on the item master data to open web product details.